Sometimes in your workflow you need to compare two different assets. For example, you have a hundred of pictures from your latest photoshoot. Many of them are quite similar, so you need to compare them and choose the best shots for further post-production. With Pics.io it’s a super-easy thing to do. Select any two assets inside a collection. You can do it by holding down Cmd (for Mac OS) / Ctrl (for Windows) on the keyboard and selecting the files you need with the left click of the mouse. Find a comparison icon on the left side panel. Click on the comparison icon. The two selected assets will be placed side by side. Now you can move the slider sideways and immediately see how these two assets are different. This way of comparing files saves you a lot of time and trouble, as you don’t have to open each file separately. What kind of assets can I compare in Pics.io? 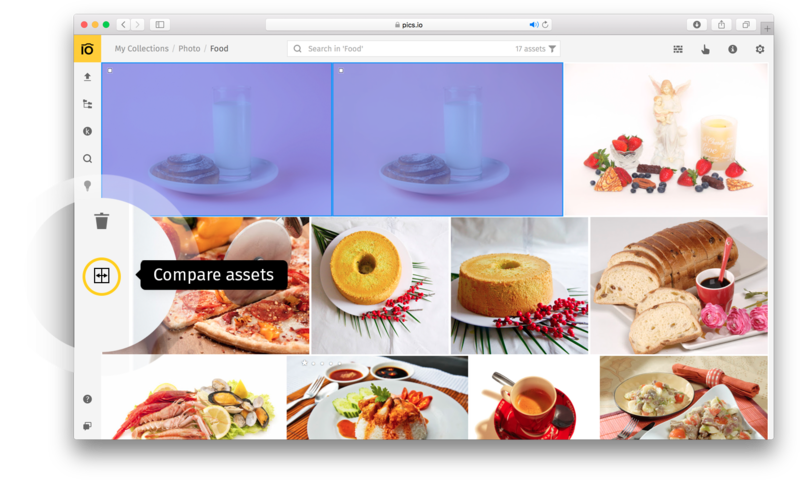 You can compare a huge variety of assets in Pics.io: images, raw photos, Sketch files, PDF documents, video files, etc. Read more about all file formats supported in Pics.io. Can I compare different file formats in Pics.io, e.g. JPG and PDF? Yes, you can. 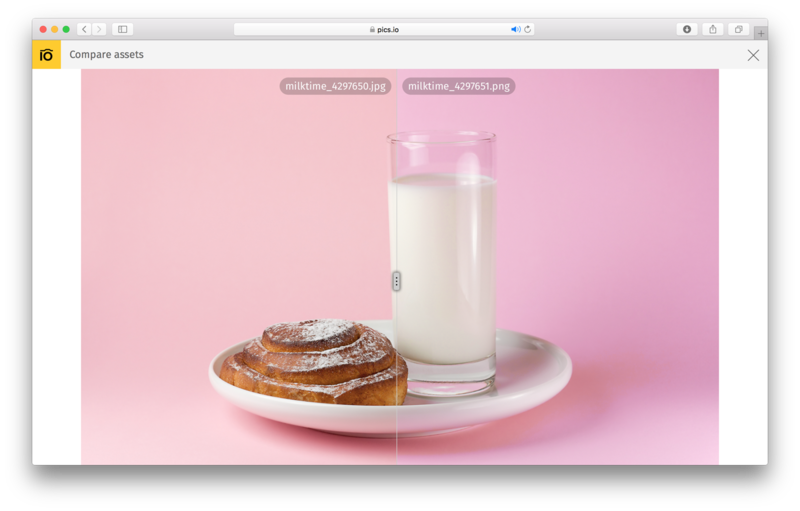 Pics.io allows you to compare two assets that belong to different formats. For example, you can compare JPG and PDF files, Adobe Illustrator and InDesign documents, video files that were saved in different formats, etc. A small disclaimer here is necessary. Please, don’t try to compare file formats that are totally incongruous, such as images and video, for instance. That just doesn’t make sense. Can I compare more than two assets at a time? No, you can’t. Pics.io allows you to compare only two assets at a time. So, when you select files for comparison, make sure you have selected no more than two assets at a time. How can I compare two versions of the same asset? Pics.io has a very simple and effective version control tool that helps you manage different revisions of the same asset. You can read more about it here.